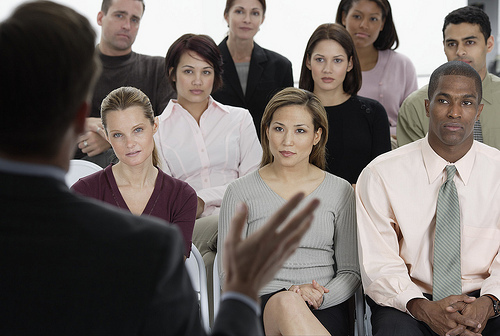 In last week’s blog post, we talked about tips for attending a seminar. This week, we will go over some tips for presenting at a seminar. For first time presenters, the idea of talking in front of a group of people can seem pretty daunting. But hopefully with these tips, we can help put you at ease. Know the logistics. How long do you have to present? Will there be a Q&A session afterward? Ask about technology— is the room capable of projecting a power point? Will you have access to the Internet? Can you use your own laptop, or do you have to use the one provided? Prepare. Once you know how much time you have to present, you should plan your talk accordingly. Include an outline slide when using a PowerPoint so that your audience knows where you are taking them in your presentation. Do not bog down your slides with lots of words. Include only key words or points, but most importantly, make sure to have appealing visual displays. Practice over and over. Don’t read your slides word for word, and don’t learn them verbatim. When you’ve memorized a presentation, your voice tends to stay in the same register, and your audience will quickly get bored. Try to keep a conversational tone, which will happen naturally if you take the time to learn your presentation topic and not just memorize a speech. Drive attendance. Market yourself— send out emails to your network explaining the logistics of the seminar. Let them know the big picture of your presentation and how their company could benefit. Back up your presentation. Make sure that you have your presentation in at least two different forms. For example, send your PowerPoint or visuals to yourself in an email, and also put it on a flash drive. Arrive early. Get to the room you are presenting in early, and if allowed, start setting up. That way, if you need something or the Internet isn’t working, you have time to find someone to help you fix the problem. Q&A session. Try to answer the questions to the best of your ability. If you don’t know the answer, tell your audience that you are not sure, but will think about it. If an answer comes to you that seems correct but you aren’t sure, let the audience know that you are speculating. Learn from your presentation and reflect. What will you do differently next time? What worked really well? And don’t forget to have fun. You’re a leader in your field, and being able to share your knowledge is something many people don’t get to experience. Have you presented recently and have any other tips? Leave us a comment. You can also let us know on Twitter or LinkedIn–we’d love to hear your thoughts.